Genkotsu Ramen, Eight Mile Plains, Brisbane - my name is Food. Sometimes in life, you may want to eat out at fancy restaurants or maybe the newly opened restaurant that everyone is hyped up on. However, there will always be that comfort food whether it may be a good ol' burger or just your mother's cooking or even just a big bowl of fried food. Now, a big bowl of ramen may not suit everyone but trust me, during winter or rainy days, you would definitely want to put your hands around a hot bowl of ramen filled with goodness. Genkotsu reminds me of the Ramen eateries in Japan, petite but cozy serving up good classic comfort food. 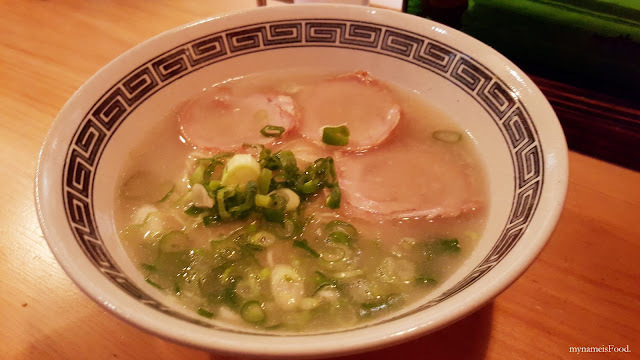 'Shio' (AUD$9.5) was a Ramen with a salty base soup which allows those who aren't a big fan of the Soy Sauce based soup but would still like the original Tonkotsu without all the extras. 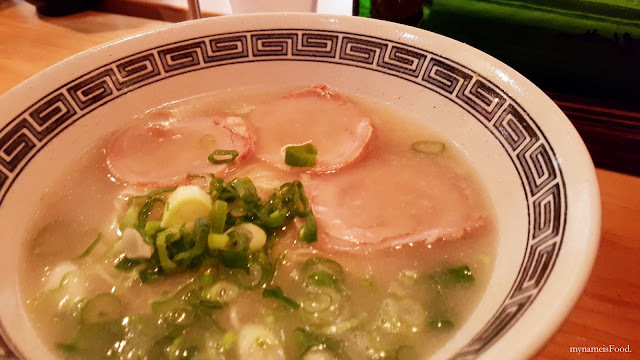 Served with Pork Chashu and shallots, very simple but I do believe that the salty base soup can be too salty for some. There are also chilli powder and sesame if you would like to add or alter the original soup to your liking. 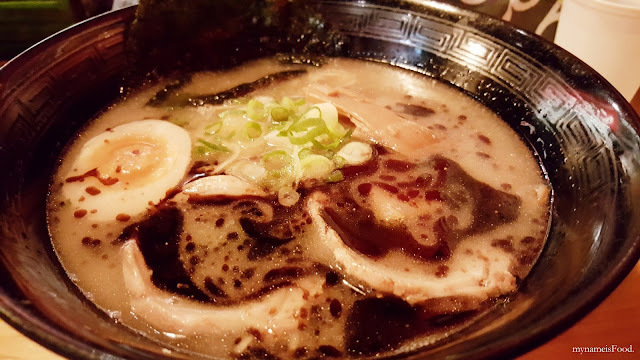 'Black Garlic' (AUD$11) has a Shoyu (Soy sauce) base soup which combines perfectly as it blends together well. Served in a large black bowl with Chashu pork, bamboo shoots, shallots and the main star of the dish, the black garlic oil. 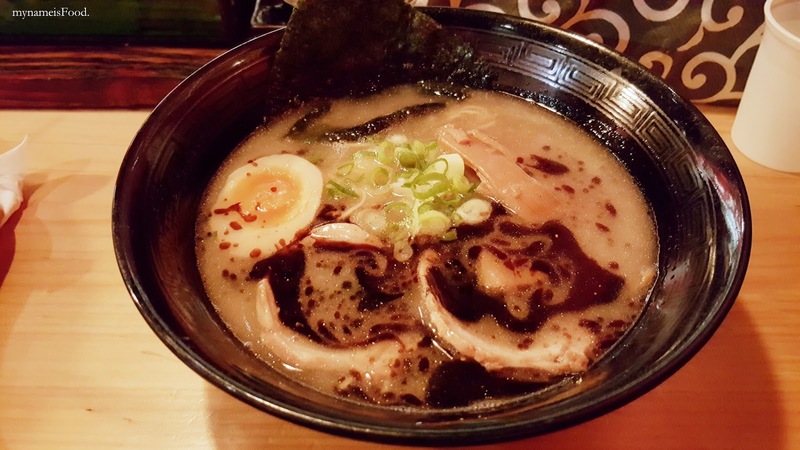 The ramen itself was thin and cooked well, it was chewy and not overcooked until it was soggy. The slow cooked egg had its own flavour as it has absorbed all the goodness it has been cooked in. The soft Pork Chashu melts in your mouth and basically is another highlight of the dish however, I have to say that after mixing the black garlic oil with the soup, it definitely will blow your mind and tastebuds and allow you to experience something different than the normal Ramen you usually eat. The soup was very rich and had a strong depth of flavour which was comforting. Just a note before you do come in, seats are very limited and there are usually a queue at peak hours with people waiting outside the door. It is a very tiny place with probably only fitting about 20 or so people hence the fact that they have bench seats which sometimes you may just need to share with other diners. The good thing is that the service is fast and after ordering and finding a seat, the next thing you know, your Ramen is ready..